Pink and White Polka Dots!! How great for your Minnie Mouse Party! 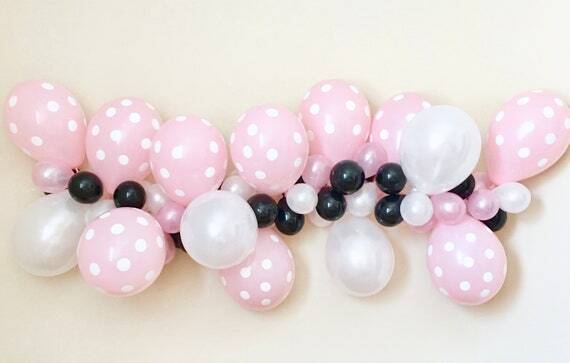 This garland is a great way to add that pop to your party. Making your own backdrop has never been easier! With this complete kit you can make a beautiful statement piece that will wow your guests! The 4, 6 or 8 foot garland is the perfect size to put over your dessert or present table or pick a 10, 12 or 14 foot one to really make a statement! You can hang it as an arch, in a straight line or drape it on a table. ~ Easy to follow step by step instructions. ~ It will take you approximately 45 minutes to assemble a 4~8 foot garland. For the 10-14 foot garlands it will take about an hour and a half. You can assemble it 1-2 days in advance. All balloons ship flat and deflated. Need different colors? Please message me so I can make your vision a reality.